First outing for a while, preceded by the collapse of various banks, a catastrophic fall in the pound, and – surprise – a massive quiz defeat last night at the hands of the Harp. LM’s 0902 to New Street almost on time (just 2 late) and smart as usual. No problems getting to BHI (1006 stopper from BHM, an LM 323) where Czech dosh had been pre-ordered – very fortunately I’d anticipated the pound declining, though not so much, and saved a significant chunk of money as a result. Total mayhem at T2 with the much expanded facilities seemingly unable to cope with the influx of Ryanair passengers. The queue stretched through a 4 lane rat’s nest leading to security, back down the stairs to the ground floor, and out of T2 to the foot of the stairs to T1’s upper level. It took 45 minutes to negotiate so it was good thing I was early. Fortunately I still had time for an excellent Highgate Old Ale at the very busy airside ‘Spoons. Ryanair called us on time then kept us standing at the door (and the first bus load of pax standing on the bus with open doors on a very cold day) with no explanation whatsoever. It took for ever to load a full planeload, we missed our slot and left an hour late in the end. Unbelievably the captain blamed the closure of the M6 due to an early morning accident which, he said, caused half an hour delay for all flights. Yeah, right. Eventually got to a sleety, cold Praha and had a fruitless trog out to Pivní Galerie near Holešovice station, where I’d hoped to get a particular brewery shirt – none to be had (this took a 119 bus and trams 8, 1, and 5 to discover). A walk up to Holešovice and another 5 got me to the Hotel Ariston where it was ‘alles in Ordnung’ thanks to HRS. Decided against the city centre at 6 p.m. on a Friday after last week’s experience at the Grey Horse in Manchester [not only was the Grey Horse wedged, but also the Circus Tavern and the Old Monkey. What recession?] The Richter brewpub accordingly beckoned and I made my way out there via a tram error where I managed to misread the approaching 19 as a 10. Luckily I realised soon after boarding and was able to rectify the error at Palmovka where the routes diverge. A superb beer and goulash (supplied with dumplings and bramboraky) event ensued, though there was no music this time [see 2.11.07]. The pub was heaving again and I was lucky to get a seat. I’d lost the spirit of adventure, sitting in a nice warm pub, so got the trams back to the hotel (no mistakes this time) and settled for an early, if hot, night. Despite turning all the radiators off it was still 22.5ºC at 05:00. The final frontier – will I get that curve? Who knows. Started well enough anyway, with tram 9 to hlavní, a cup of coffee and a (so far) empty compartment in a posh air con ČD 2nd on EC178, 0625 Praha hl.n. – Berlin Gesundbrunnen. Left from N5K1 and via the southern tunnel, as required to get round to Holešovice. Out to Ústí at what constitutes a brisk pace on ČD, arriving on time and in time to grab some breakfast from the shop, find the bus stop and ticket machine, and catch the no. 11 bus at 0756 to Střekov. Here the gricers were starting to gather, one caused alarm by pointing out the notice saying the special was running on Monday… PR texted from Velké Březno to say there were signs of life amongst the preservation, er, items in the yard there. He arrived at Střekov a few minutes later on a wheelie bin from Děčín. The assembled throng of 40 or so were duly relieved to see the M131 pass by at relatively high speed on its way to Velké Březno. Late, obviously, but in good form. The M131 reappeared about half an hour later (and similarly late) towing a very rusty and grubby trailer in which we had the ‘pleasure’ of riding to Litoměřice horní nádraží. But hey, we did the curve! 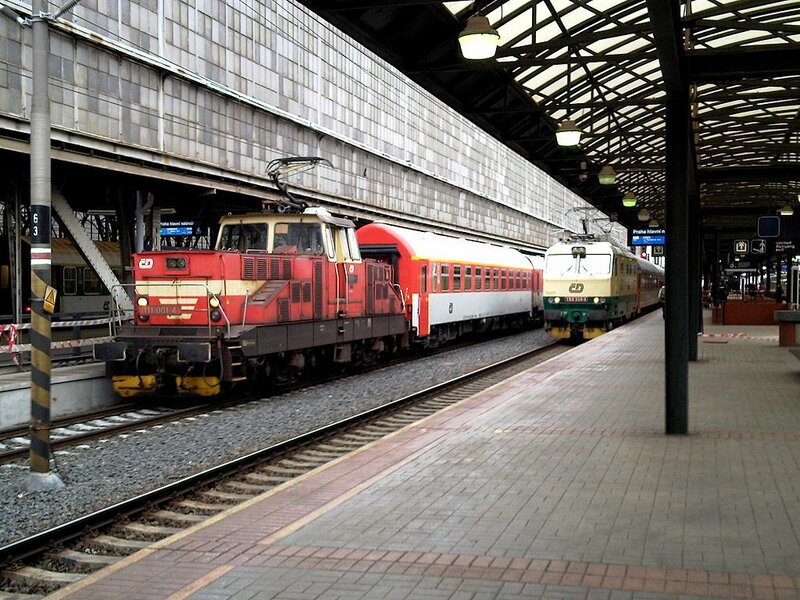 After a celebratory Gambo in a herna bar near město station it was off to Všetaty for another in the station buff, awaiting an 83x into Praha hl.n. via Vysočany – first new connection done! An hour’s wait at hlavní afforded an opportunity to visit Ferdinanda, a Ferdinand house just across the park from the station. All rather trendified and bistro-pub-ish but a nice enough glass of a brew I’m quite fond of, and a steak with pepper sauce both of which went down very well after the early start to the day. 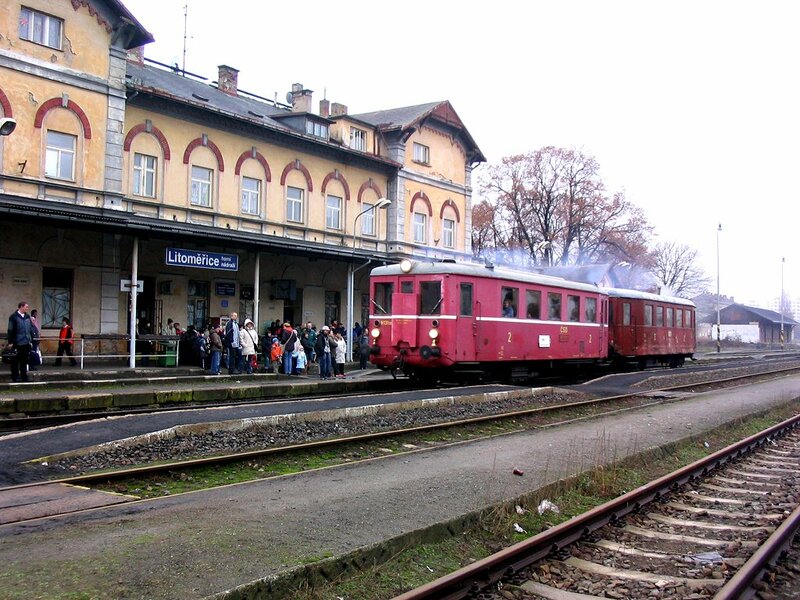 All downhill then – EC109 to Kolín had the loco on the south end and duly went out the wrong way (via Vršovice). The planned return, EC144 was booked via Vršovice anyway, so we caught R675 instead which was booked non-stop but to no avail, it went via Vršovice just the same (but didn’t stop there). Harrumph. Defeated by the hlavní – Libeň link we returned to Hotel Ariston for PR to get his room, and thence by assorted trams (and yet another minor error!) to Zlý Časy, a multi beer ‘free house’ in Nusle which had a children’s party in full swing and was closed to itinerant gricers unless they wanted to drink Staropramen in the small bar upstairs. We didn’t. 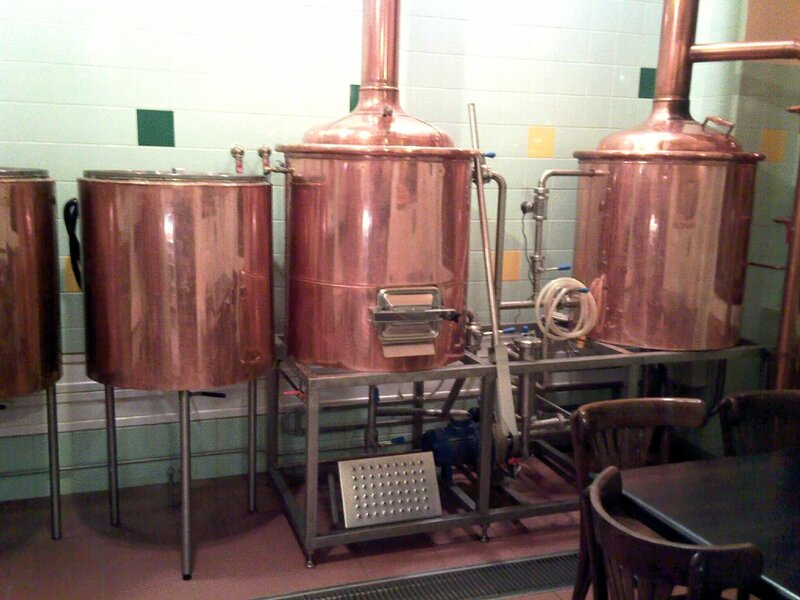 Round the corner therefore, to the Pivovar Bašta, an unpretentious and amiable enough brewpub with a nice unfiltered Ležák. To finish off the home brews we moved on to Pražský Most u Valšu, a far more upmarket establishment in the old town which furnished us with more unfiltered Ležák and a very tasty leather, or rather beef, goulash. Final port of call was Pivovar Klub at Florenc, son of Pivovar Dům, which I’d mistakenly believed to have its own beer for public consumption. 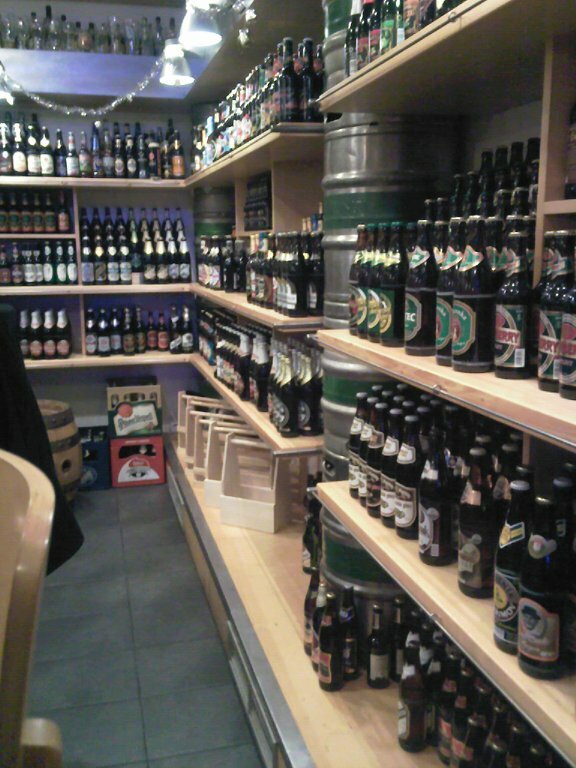 It doesn’t, having a beer from its parent and a selection of others (plus an awe-inspiring collection of bottled beers from The Czech Republic, Belgium, Germany etc.) I tried a Christmas beer whose name escapes me, and the weizen from Primator which was a fully paid up German-style one and none the worse for that. Far better than their run of the mill products, for my taste. Photographic conditions were just about impossible but I felt obliged to photograph the start of the curve! The line to the left is the Ústí nad Labem - Lysá nad Labem main line (Ustí in front of me, Všetaty and Lysá behind me). 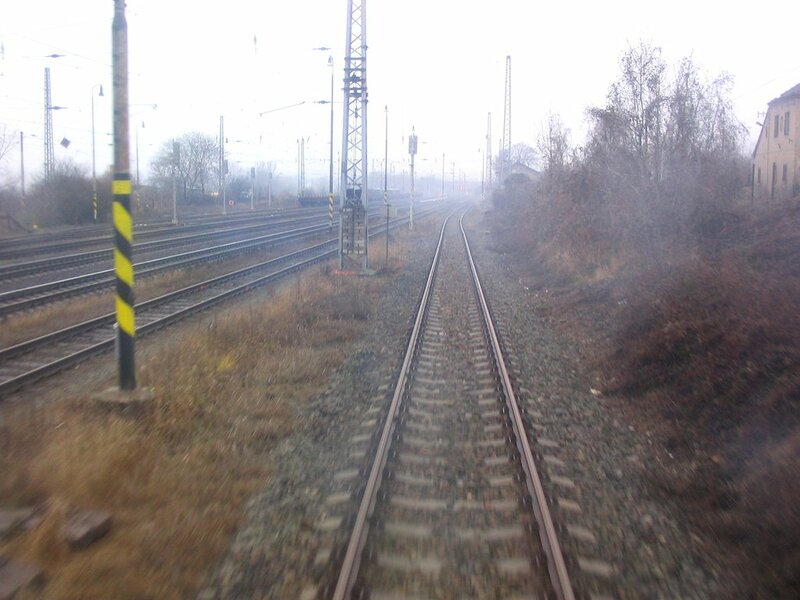 The train is climbing away from Velké Žernoseky; the 'fog' is actually exhaust from a hard working M131! A gloomy morning after a poor night (temp down to 17ºC having had the window open since 1600 yesterday). After insisting that the two grumpy receptionists allowed me to pay my bill (‘come back after breakfast, we’re changing shifts’ is not quite in accord with my concept of customer service – reminds me of certain airlines) a reasonable enough breakfast was on hand at 0700. I’d had the idea of looking at the train formation lists at hl.n. to get some clues as to which way the trains would run, so called in there on the way to Masarykovo. They weren’t working, displaying the usual page not found messages. [I found out why, later]. Being lucky with a tram 26 I still made it to Masarykovo in adequate time to find out that my 24 hour Praha ticket would take me to Vysočany - I had been told by the DPP man at the airport that it wouldn’t but both ČD’s booking clerk and the train’s guard said it would, so that was good enough for me – and get the 0751 City Heffalump thereto. What a horrible place it is too. The trip did however establish that the connection from Masarykovo is indeed a split alignment with the ‘down’ line diving under the lines to/from hlavní. An hour (nearly) at Vysočany was definitely second prize so I had a ride to Palmovka and back on the Metro to fill up a bit of time before getting another Elefant back to Masarykovo to do the other side of the diveunder. Then it was the 0915 local to Libeň (a diveunder again for the ‘down’ side to pass under the now infamous hlavní-Libeň lines) and a 25 minute wait there. I got a bit overexcited when signals cleared eastbound there and a passenger train appeared, but it turned out to be a Slovak electric with EC275, 0930 Holešovice – Bratislava. Yet another Heffalump back to Masarykovo where another lucky tram got me to hlavní just in time to run to N5K1 and find EC115, 1009 to Warszawa, with the loco on the Vršovice end. That’s that one no good, then. A bit of hanging around rewarded me with the stock for EC121, 1109 to Košice, coming in early with the loco on the Vršovice end again. Sigh. So that was that for hlavní to Libeň. Off to Holešovice on line C then, to get 1218 back to hlavní for extra certainty on the eastbound curve from Holešovice on to the hl.n. (south tunnel) lines. Froze for an hour at Holešovice, train arrived from Cheb on time, sat at N2 for 12 minutes and was then caped. The gripper came round and turned everybody out. Oh, very well done, ČD! And that was it. Back to the airport via C, A, 119 as usual. Another truly dreadful ‘customer experience’ with Ryanair who called us at about 1510 for the flight which hadn’t even arrived, then kept us standing on the bus for a good 25 minutes. The aircraft had to be de-iced [I didn’t begrudge that!] and took off at 1620 (sched. 1550) but with the usual Virgin Trains-style timetable padding, claimed an early arrival just before 1710. Sell, sell, sell for the first half then a crew preoccupied with stocktaking and balancing the books. The standard announcements were rattled through with such speed and insincerity that you really wondered why they bother. BHX was in much better form today and I was straight through Immigration and over to Birmingham Irrational at 1719 for the on-time LM Desiro at 1722 to New Street. Much good did it do me as the next service to Telford was the 1809 ATW from Irrational to Aberystwyth provided of course that it didn’t get caped inbound due to late running. Got to Wolves on a late running Bendyleano, with just time to nip to the Great Western and find it had no Golden Glow and the Old Ale had been and gone. Altogether very much in sympathy with the way the day had gone. I settled for a Special, which was anything but. Final stage of the journey was on the ATW 158 which did turn up [shape of things to come? I dare to hope] and was 9 minutes late but through no fault of its own as it was competing for P1 at Woverhampton with a terminating LM 323 which had to reverse and return to Soho, followed by an XC Voyager to Edinburgh. A spirited thrash out to Telford recovered 2 minutes and H was waiting with the car for the most comfortable and punctual part of the trip. On reflection I suppose this trip was about par for the course. It isn’t often that everything goes right. There were no advertised moleworks but as I can’t imagine they built all those highly expensive tunnels and flyovers on the Libeň line just as a PR exercise, I have to assume that the Vršovice business was temporary, perhaps while the new Mas to Vysočany ‘route’ avoiding the reversal at Libeň had its first day. No doubt something will necessitate a return visit and I’ll be able to knock those two lines off the list in the end. The next venture is to be Austria and is already booked – after that until the pound strengthens against the Euro, if it ever does, I’ll have to consider very carefully whether I ought to get out less! 111 001 on station pilot duties and 150 224 on an EC to Košice at Praha hl.n. on 14.12.08. 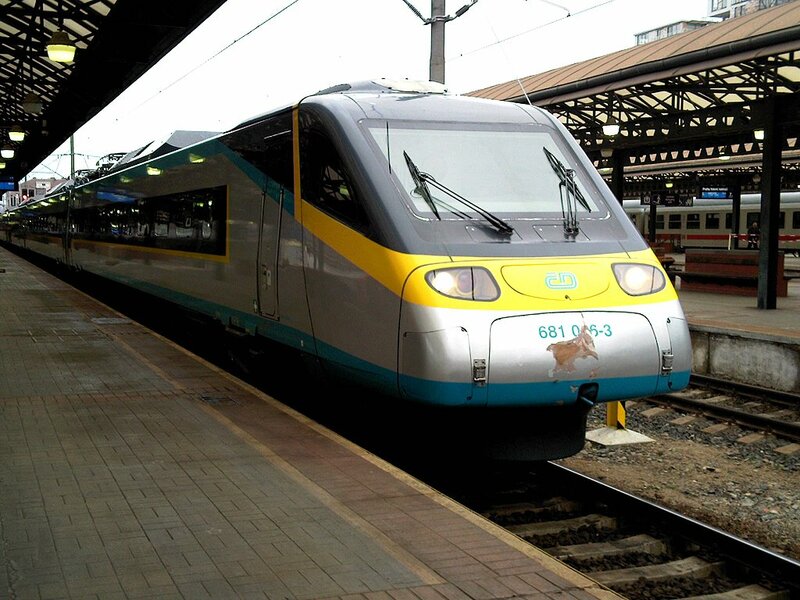 Pendolino 681 006 stands at Praha hl.n. forming SC17 to Wien on 14.12.08. I don't know if the damage is a bird/animal strike or a shunting accident. The two week Christmas break gave me an opportunity to get away for a few more days, so the last venture of 2008 I returned to Austria.